In Pennsylvania, 144 people die by suicide each month. In Centre County, approximately 15 suicides occur each year. These deaths are nearly 100 percent preventable. To raise awareness and better help people understand what they can do to help prevent suicide, September is Suicide Awareness and Prevention Month in Centre County. A number of events are scheduled throughout the month to focus on the issue. "We need to continue bringing this issue to light, and do what we can to preserve the young lives here in Centre County," Marisa Vicere, founder and president of the Jana Marie Foundation, told the Centre County Board of Commissioners last month. Vicere is leading a new Centre County Suicide Prevention Task Force along with Shanon Quick of Centre County Can Help. The task force will launch a "Step Up for Mental Wellness" campaign at noon on Tuesday outside the Centre County Courthouse in Bellefonte. Commissioner Michael Pipe, radio personality Jason Crane, suicide survivors and others will speak, and local musician Eric Ian Farmer will provide live music. Yellow “Step Up for Mental Wellness” ribbons will be provided to all attendees, and the ribbons also will be placed on trees around the county. "The ribbon represents a commitment by our community to make mental wellness a top priority," Vicere said. "We want our citizens to be able to get the help they need without fear of prejudice and discrimination. Displaying this ribbon represents our community's way of changing the way we treat, communicate and support individuals working toward mental wellness." Vicere founded the Jana Marie Foundation to help young people make positive choices and maintain self-respect and healthy relationships after losing her sister, Jana Marie Vicere, to suicide in 2011. On Sept. 10, which has been declared Suicide Prevention Day in the county, the foundation, along with Active Minds of Penn State and the Central PA Chapter of the American Foundation for Suicide Prevention, will host "An Evening of Hope, Healing and Remembrance." 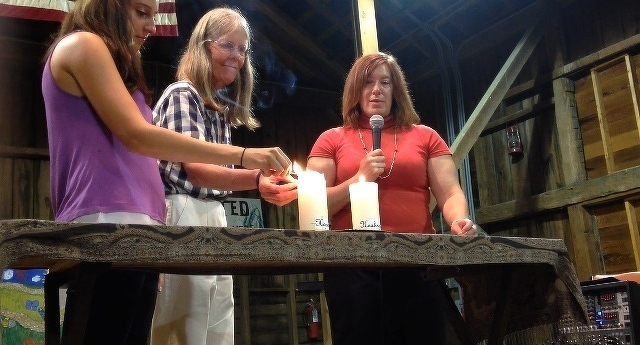 The free, public event will be held fro, 6:30-8 p.m. at Millbrook Marsh and will feature "an inter-generational performance piece focused on strength, hope, recovery, peace and voice," and will conclude with a candle-lighting. A community brown bag picnic will begin at 5:30 p.m.
A a Youth Mental Health First Aid Course will be held on Sept. 14 at the Ferguson Township Municipal Building. The 8-hour public education program educates participants on risk factors and warning signs of mental health problems in adolescents, the importance of early intervention, and how to help an adolescent in crisis or experiencing a mental health challenge. Advanced registration is required for the course, which is open to the public. Contact [email protected] for details. The 3rd Way Collective and Learning to Live: What’s Your Story? will host "Laughter is Sacred Space" a performance by Ted & Co. Theaterworks at 7:30 p.m. on Sept. 20 at Faith United Church of Christ. "In this gritty and dramatic talk, Ted Swartz walks you through his relationship with friend and business partner, Lee Eshleman, who took his own life in 2007," according to a news release. "Ted explores the paradox of working with a comedic partner struggling with bipolar disorder, as well as the challenge of writing and performing stories about God while experiencing the absence of God after Lee’s death." For more information, visit www.janamariefoundation.org. 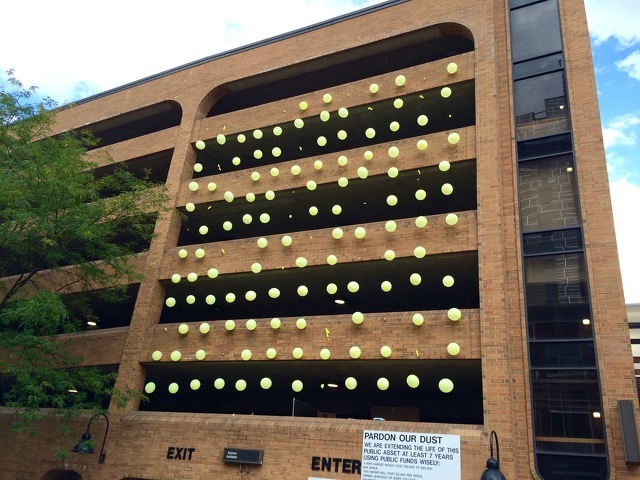 A grid of yellow balloons adorns the facade of the Fraser Street Parking Garage this month. The goal: To raise awareness of the 144 Pennsylvanians who die by suicide each month and encourage prevention efforts.